There are a lot of top reasons to visit the Australian Capital Territory mainly due to its numerous tourist attractions that you will surely love. The strongest point is its natural tourist spots that will simply leave you awestruck with its marvelous beauty and stunning landscapes. That’s why if you are planning an Australian tour, then most certainly do not forget taking a trip to the Australian Capital Territory. For starters, it is best to visit Canberra which is home to a lot of Australia’s history and rich culture with its various museums and galleries. Aside from that there’s also the annual flower festival where in millions of spring blooms give life to Canberra during the days of September and October which should be one of your top reasons to visit the Australian Capital Territory. 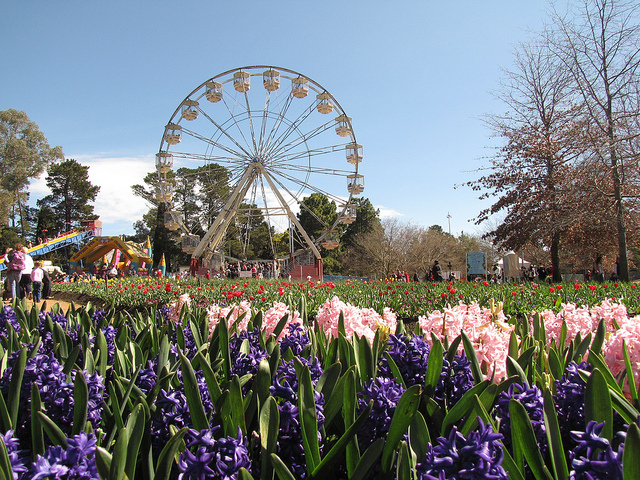 It is best to visit at this time because you get to appreciate its natural attractions such as parks, gardens and bush lands as well as the Lake Burley Griffin that come to life during Floriade. Aside from that there’s also the Floriade Night Fest that will give you pure enjoyment and entertainment with its films, markets, food and wine. Tourists and locals can dance underneath lantern-lit trees or have fun on the amusement rides. It might be romantic for those travelling with their lovers because at night you get to enjoy the magical lights with the scent of spring while you eat a connoisseur dinner and drink from its famous Night Fest Glow Bar. Not everyone may have to privilege to visit Australia anytime that’s why if by any chance you come during autumn then don’t miss the Canberra Balloon Fiesta wherein colorful hot air balloons fly in March with a beautiful skyward procession. A lot of tourists and balloon pilots as well as crews from all around the world visit and see this wonderful floating exhibition and if you want to ride in one of the balloons then you should book it ahead because not all can be accommodated. You are quite lucky if you get to ride in one of the balloons because you get to see most of the iconic national buildings like the old along with the new parliament house and other more. You get to enjoy sunny days during autumn and with that you should try seeing the Australian National Botanic Garden, Black Mountain or fish along Murrumbidgee River Corridor and a lot more. Now after the hot summer you should try something really cool and exciting. You can visit the Australian Alps where it will feed your thirst for adventure with its challenging walking tracks and other activities. You can begin in Walhalla and go up the Bogong Plains passing by the cattlemen’s huts, the beautiful snowfields of Mount Wills and Falls Creek as well as the rocky Viking-Razor-Howitt peak. You can also go up on Australia’s highest peak which is Mount Kosciuszko before going through Namadgi National Park or canoe on the snowy river of the Murray River. Other cool activities that you can also do are riding a horse and make your way to the snowy River National Park or ski on the slopes of Mount Hotham to Mount Selwyn. Certainly the list goes up on the things that you can do that’s why when you visit the Australian Capital Territory don’t miss seeing this places. There’s so much to do and so many sights to see and definitely a lot of top reasons to visit the Australian Capital Territory. No matter what month or season there’s always something to see and if you want a great escape from the busy city then hop on a plane and visit the beautiful the Australian Capital Territory because it will certainly be a great vacation.